Taking children to the supermarket is never a relaxing experience and certainly doesn't give much of an opportunity to vigilantly shop for vegetarian products. All too often, food that you would imagine would be vegetarian, actually contains hidden animal products like gelatine, cochineal (red food colouring made from crushed beetles) or animal rennet. Even honey is not strictly considered to be vegetarian as some people believe that bees are enslaved to produce the honey. Whilst buying some Strawberry Mousse at the supermarket, I was caught out and inadvertently bought Strawberry Mousse containing pork gelatine. It wasn't until I was half way through the mousse and happened to glance at the ingredients that I realised my mistake. Now I must say that I am not a strict vegetarian, but I do draw the line at some things and gelatine is one of them - eating the ground up bones of an animal fills me with as much horror as eating their meat. So this week, rather than buying mousse, I decided to make my own. 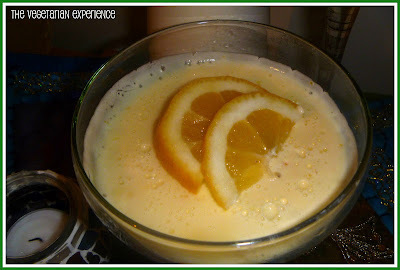 Whilst searching for recipes I came across a recipe for Lemon Posset. 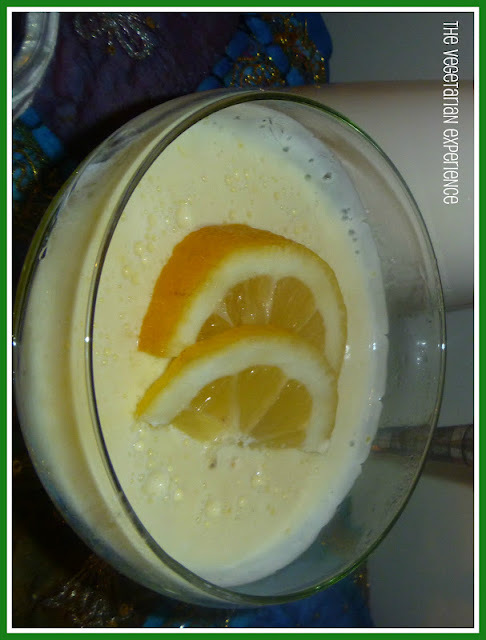 A Posset is an old fashioned English dessert, somewhere between a mousse and a creamy pudding. It is super easy to make as it only contains three ingredients and not much preparation is required - although it does need time to chill. Lemon Posset does not contain eggs or gelatine as a mousse may well often do and so I could rest safe in the knowledge that I knew what was going into my bowl would be vegetarian. The end result was light and creamy and absolutely delicious. We love lemon, and so our Posset had a very strong flavour. If you or your family are not big lemon fans, I would recommend adding the juice and zest a little at a time to reach your desired flavour, or you could use another fruit to make the Posset. Enjoy! Juice the lemons, grate the zest into a bowl and set aside. (Tip - roll the lemons around first to release the juice). Place the sugar and cream in a pan and gradually bring to the boil over a medium heat. Once the mixture has reached boiling point, simmer for three minutes. Add the lemon zest and juice to the mixture and whisk together. Pour the mixture into serving bowls or glasses and refrigerate for two to three hours until the mixture is set. Please Vote for Me in the MADS!